Former Gillan, Ozzy Osbourne and Desperado guitarist Bernie Tormé has been rushed to hospital suffering from virulent pneumonia in both of his lungs. Tormé’s family have now released a statement on his condition through his PR team which reads: “Bernie Torme, the world-renowned guitarist, with stints with Ozzy Osbourne, Gillan and Desperado featuring Dee Snider, was rushed into hospital earlier this week suffering from virulent pneumonia in both lungs. “He is currently receiving the best possible treatment and is fighting back but remains in intensive care. Tormé joined Gillan in 1979 and remained with the Deep Purple vocalist until 1981. 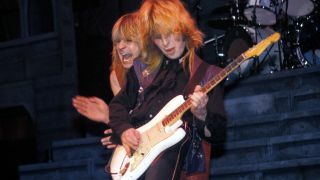 He then stepped into Ozzy’s band after the death of guitarist Randy Rhoads in 1982, but only remained in the lineup for a handful of live shows. Tormé also fronted Electric Gypsies and Tormé, which featured LA Guns’ Phil Lewis, and later hooked up with Twisted Sister’s Dee Snider in Desperado in 1988. The guitarist's most recent album was Shadowland, which was released in November last year.